Raúl Fernández’s whistle resonates through the wild avocado trees just off the main road in San Gerardo de Dota, a small mountain village where birds far outnumber humans. There is one particular bird Fernández hopes his call will attract, a bird that has made the town famous: the resplendent quetzal. Known for its brilliantly colored plumage and long, magnificent tail, the rare quetzal is a sight that anyone, bird enthusiast or not, feels lucky to behold. Once common in the mountain jungles of Central America, the quetzal now appears on the endangered species list, making the task of finding one increasingly difficult for the hordes of avid bird watchers looking to check a quetzal off their list. These days, they’re passing up north-central Costa Rica’s Monteverde, once the prime destination for those in search of the elusive quetzal, because they see the tourist rush as detrimental to bird-watching. But San Gerardo is still pristine, still quiet. In the avocado grove, Fernández continues whistling, pausing every so often to gaze through his binoculars. It’s early July, the middle of the Costa Rican rainy season, when the birds normally retreat deep into the forest to feast on the frogs and lizards newly spawned from the trees’ waterlogged bromeliads. But the rains came late this year, Fernández assured us, and there is still a chance that a few quetzals have stuck around for the small, dense avocados that thrive lower in the valley. He instructs us to watch the trees, keeping our eyes peeled for a glimpse of a red chest or a flash of iridescent green feathers reflecting the sunlight. 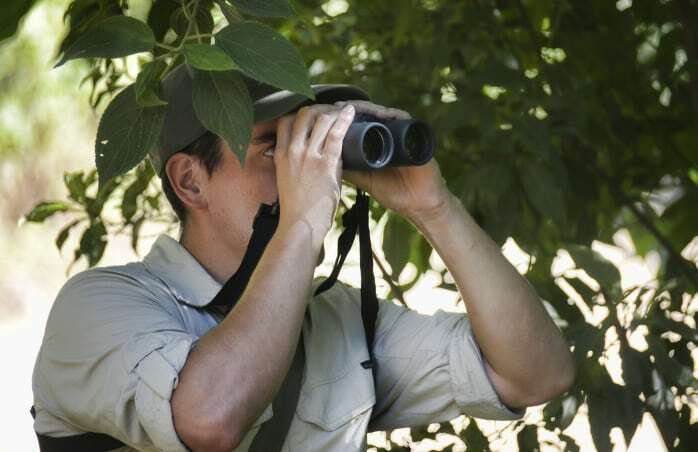 There are so many trees, and the task seems impossible for an inexperienced bird watcher. If there is a quetzal to be found, it will be Fernández’s trained eye that spots it. Even having grown up surrounded by quetzals, the birds still fascinate Fernández. Still scanning the trees he tells us about the animal’s history, the myths that started our longstanding infatuation with the quetzal. Long ago, before the Spanish conquistadors imposed the value of gold onto Mesoamerican societies, the Mayans and the Aztecs used quetzal feathers as currency. According to Fernández, the birds were thought of as gods due to their incredible beauty and their seemingly miraculous ability to foretell rainstorms with their nesting patterns. They were so accurate that the Aztecs dubbed the quetzal the god of corn, because of the rain they brought their crops. They looked up at the quetzals tail-waving flight patterns and saw not the mating ritual scientists do, but a sign from the gods that water was coming. Although the beautiful bird was a popular pet, poachers soon discovered that the quetzal would sooner kill itself than be kept in captivity. The bird became a symbol of liberty, and in 1871, Guatemala adopted the quetzal as its national bird, even naming its currency after it. Though indigenous societies sometimes hunted the birds for their feathers, their endangerment is a product of the modern world. As Europeans settled in Central America, they built cities, they cut down trees and they destroyed the quetzal habitat. The Savegre River runs straight through the San Gerardo Valley. Much like the Aztec and Mayan societies that worshipped them, today quetzals are nearly extinct in northern Central America, including Guatemala. By contrast, Costa Rica has preserved much of the bird’s territories in national parks and reserves, making it one of the best places on earth to catch a glimpse of a resplendent quetzal. As the quetzals continue to disappear from Guatemala, San Gerardo de Dota, in Los Santos region of southern Costa Rica, has seen a resurgence in its populations due to the community’s decision to reforest a number of the area’s clear-cut former dairy pastures. Just as in the pre-Columbian legends, the quetzals found in San Gerardo are considered divine. Hotels and restaurants feature the bird’s name and more than one of the area’s businesses have constructed church-like stained glass windows depicting the bird’s likeness. “I would say more than 90 percent of the people who come here do so with the quetzal in mind,” Fernández said. Fernández’s grandfather Efraín Chacón was San Gerardo de Dota’s very first resident, and when he and his brother moved out to the valley as part of Costa Rica’s homesteading program in the 1950s, they envisioned it as a dairy farm. The family clear-cut 80 acres of the virgin woodlands and successfully marched entire herds of cows through the thick cloud forest to their new farm. Years later, the valley had slowly gained recognition among fly fishermen for its abundance of rainbow trout, but the Chacóns continued clear-cutting and expanding their farm. In 1982, Leo Finkenbinder, a professor at Southern Nazarene University in Oklahoma, wound up in San Gerardo studying the river’s algae. Through cold nights by the fire, Finkenbinder and the Chacóns became friends. Finkenbinder began studying Spanish and he helped Efrain’s eldest son, Marino, with his English. Finkenbinder and his students began writing letters to the Chacóns about the forest, hoping there was a chance the family would reconsider. It took a year, but in 1984 Marino called to tell Finkenbinder they had decided not to cut any more trees. Finkenbinder returned to Costa Rica, and he began bringing students down to study the birds. Eventually he helped found the Quetzal Education and Research Center on the Chacón’s property. The center’s foundation came with a contract stating that the Chacón family would sell their cows and reforest their land. Soon other farmers followed suit and, trees began sprouting in the previously empty pastures. 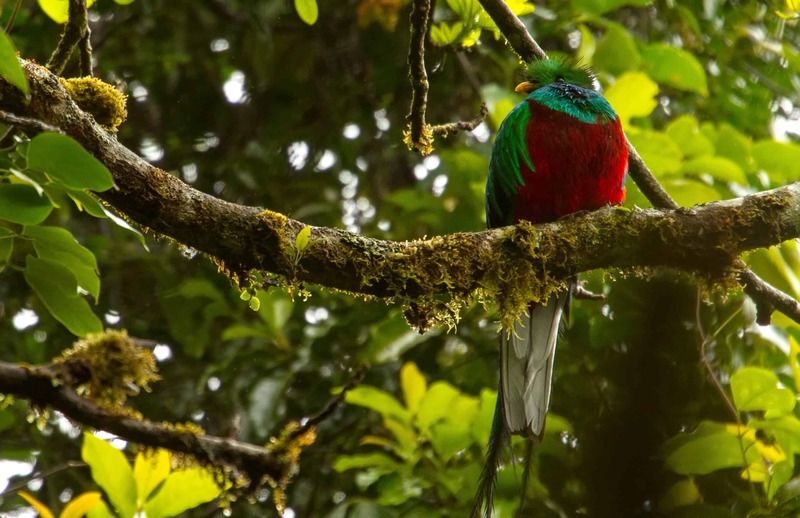 With the trees came the quetzals, and word traveled fast among birdwatchers, who began flocking to San Gerardo from all over the world in hopes of checking the quetzal off their “life-list” of birds. The younger Chacón generations are no longer dairy farmers, but tour guides and hotel managers. The Costa Rican government also recognized the potential for tourism and set apart 5,021 hectares of land near the valley in 2006, creating Costa Rica’s newest national park, Los Quetzales, but, as every guide in San Gerardo knows, you don’t need to be in the park to spot a quetzal. The avocado grove is as good a spot as any. At least that’s what Fernández assures us as we power up the mountain roads in a Tracker on our search for the famous bird. Glancing at the thick knots of trees surrounding the road, it seems impossible for anyone to spot a small bird on the branches. We worried that even in the infamous San Gerardo Valley, we might not have the good fortune to spot a quetzal. As we climbed the last hill before our destination it became apparent that we were not alone. Three cars, a tour bus and a cluster of people all sat at the road’s edge. Everyone’s eyes were on a nearby avocado tree. Right there, just by the roadside, was a quetzal, the mythical creature that was a god to the Mayas and meant freedom to all of Guatemala. All of these people were here just to see this bird. Some had traveled for miles, from other continents and across an ocean just for this moment. My fears quickly dissapated and were replaced, instead, with bubbling excitement. Before we stepped out of the car and joined the eager crowd, Fernández shared his simplest trick for spotting quetzals, a trick that his family’s investment in eco-tourism made possible.